Eleanor Roosevelt, “Eleanor Roosevelt,” Histories of the National Mall, accessed April 23, 2019, http://mallhistory.org/items/show/330. 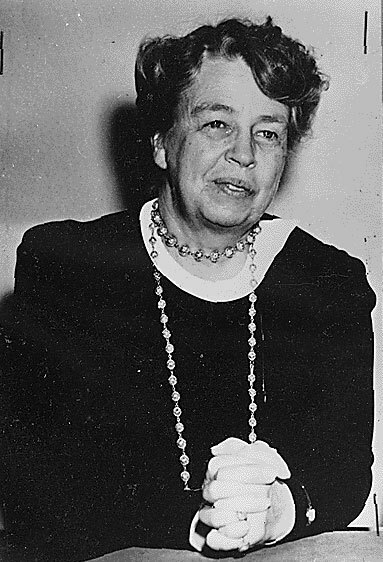 As First Lady, Eleanor Roosevelt championed equal opportunity for all races and for women, often communicating the opinions of civil rights leaders to President Franklin D. Roosevelt and his administration. Roosevelt resigned from Daughters of American Revolution in 1939 when they refused to allow Marian Anderson to sing in Constitution Hall because she was African American; she then helped organize Anderson's concert at the Lincoln Memorial. Roosevelt was also an ally to A. Philip Randolph, particularly in the early 1940s when civil rights leaders were protesting discrimination in the defense industry. Roosevelt encouraged her husband to meet with Randolph and others in 1940, and again in 1941. Franklin D. Roosevelt Library. View original photograph. Born 1884, Anna Eleanor was a member of the prominent Roosevelt family of New York. Her father was the brother of Theodore Roosevelt. In 1905, she married Franklin Delano Roosevelt, a distant cousin. Throughout her adulthood, Roosevelt was publicly outspoken on issues she considered important, such as expanded roles for women in the workplace and the rights of African Americans, Asian Americans, and refugees. FDR was elected President of the United States in 1932, having served as Governor of New York since 1929. During her time as First Lady (1933-1945), Roosevelt wrote a regular newspaper column called "My Day" in which she discussed not only her daily life but the humanitarian issues she was working on. Within the White House, she often brought humanitarian and civil rights issues to the attention of her husband and his administration. After her husband’s death, Roosevelt remained active in politics. President Harry S. Truman appointed her a delegate to the newly-formed United Nations in 1945, and she served as the first chair of the United Nations Commission on Human Rights. At the FDR memorial on the National Mall, Eleanor Roosevelt stands in front of the United Nations symbol, emphasizing her important role in the early years of that organization. For the rest of her life, Roosevelt remained an outspoken advocate of human and civil rights.